Containing remixes from THE HACKER, DAVID CARRETTA & WORKERPOOR!!! Radical G & The Horrorist "Here comes the storm" Here it is, Here comes the storm. The long awaited release by RadicalG and The Horrorist is finally there. We knew this collaboration would end up in a truly BOMB. The raw vocals of Oliver Chesler on the Typically EBM sounding techno by RadicalG is a winner. Off course this track has a hidden message to the world we live in and it's not really about a storm, the video by Unleashed visuals shows it all. 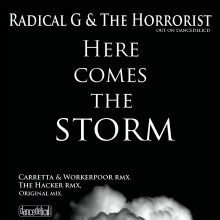 On top of the original mix we get a "Carretta & Workerpoor" remix which will blow you away and cherry on the pie is the remix by "The Hacker" who doesn't need any introduction. Supported by Dave Clarke worldwide on Whitenoise radio. If you like good dark mind-blowing stuff, this is it. The combination of this whole package is fingerlicking good ! !